Hello again everyone, welcome back. I’m posting this picture for the third and final request I got last Friday, this one for “mountains and water scenes”. I’m taking that to mean “scenes with mountains and water”, although it could have been two separate requests, not sure. I wasn’t originally going to post this particular shot (not “I wasn’t planning on using this picture for today”, instead, “I wasn’t planning on this picture ever seeing the light of day”), but I was flipping through some pictures from soon after my kid was born, and I saw a couple of these. We went on a drive up to Snoqualmie Pass when he was just a few weeks old, so this was right before sunset while we were up there. 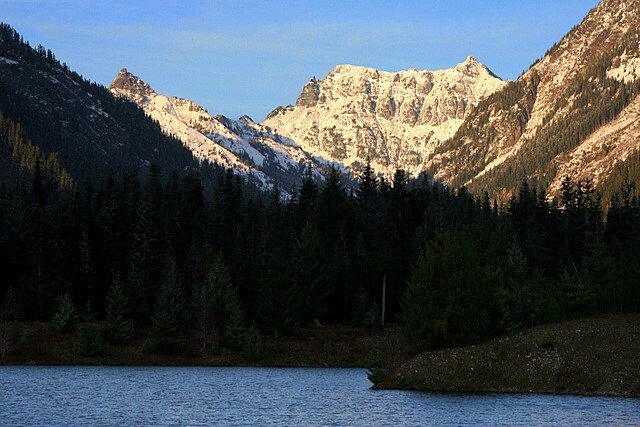 This is Chikamin Peak, and the water is Gold Creek Pond. Gold Creek Pond was the site of a big gravel pit during the construction of I-90 over the pass, so when they were finished building the highway, they turned it into this nice little pond, complete with picnic area. It’s a really pretty spot, and the view down the valley to Chikamin Peak is fantastic (and you can see it from the interstate). It’s a nice place to stop if you’ve got 20 or 30 minutes to spare, and you want to get out and stretch your legs for a bit. Notes: Canon EOS Rebel XT, Tamron 28-300 mm VC lens. 1/160s, f/10.0, ISO 200. Focal length: 77mm.